Almogran belongs to a group of medicines called triptanes, used to treat migraine headaches. 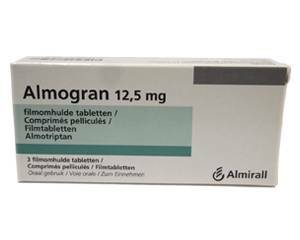 Almogran contains almotriptan, an active ingredient that narrows blood vessels around the brain, which helps to reduce the pain. Almogran is prescribed for migraines. Migraine is a type of headache that involves severe, often pounding pain, usually to one side of the head. Sometimes migraine headaches are preceded by some sort of visual disturbance known as migraine auras. Nausea and hypersensitivity to light or sound are also common symptoms. Migraine episodes can last a few hours up to several days. Almogran cannot be used to treat other types of headache such as cluster headaches or tension headaches. Take Almogran as soon as you notice headache symptoms. Almogran should not be used to prevent a migraine attack before the pain starts setting in. If Almogran does not work, taking another dose will not help. In such case, you should consult your doctor about alternative treatments. If Almogran is effective but the migraine returns within 24 hours, you can take a second tablet. Note: there should be at least a two-hour interval between doses. Almogran is not suitable for children under the age of 18. Tingling sensation in certain parts of the body and/or tightening of the throat and chest. These side effects generally disappear within a few hours. Consult your doctor if they don’t. Almogran should only be used with your doctor’s approval if you are pregnant or breastfeeding. Almogran may temporarily affect your ability to react. Stay out of traffic if you experience drowsiness or dizziness. Alcohol may trigger another migraine attack. It can also intensify side effects such as dizziness. It is important that you are aware of this and reduce or stop your alcohol intake.